John Maurice Webb (1847–1916) was known as “the gentle scholar.” A masterteacher, he served as co-principal of the famed Webb School in Culleoka and Bell Buckle, Tennessee, with his brother William “Sawney” Webb from 1873 to 1916. He was revered and adored by his students, among whom were future state and national leaders and eight Rhodes Scholars. 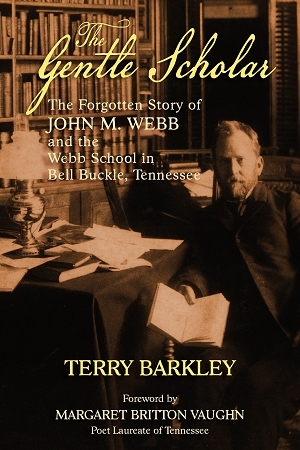 Terry Barkley brings John M. Webb out of his older brother’s shadow in The Gentle Scholar and sheds light on his unique contributions not only to Webb School and Bell Buckle, but to Vanderbilt University and the improvement of educational standards throughout Tennessee and the South from the post-Reconstruction period to the early 20th century. “A Small School That Made An Impact,” Lexington (VA) News-Gazette, January 27, 2016. “The Gentle Scholar” Author is Chapel Speaker, Signs Books,” The Webb School, August 27, 2015. “New Books from Authors with Middle Tennessee Ties,” The Tennessean, July 29, 2015. “Life, Accomplishments of Dr. John M. Webb Subject of New Book,” The Webb School Alumni Magazine, 2015. “The Gentle Scholar” Focus of WSMV-TV Segment,” The Webb School, April 21, 2015.